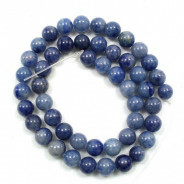 Blue Goldstone Round 8mm (~48pce Strand) - 38cm /15'" Strand. 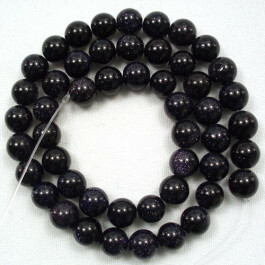 Blue Goldstone Round 8mm (48pce Strand) - 38cm /15'" Strand. Rich, dark navy blue with glittering silvery inclusions. Believed to be the stone of wisdom and science. Reminds us to look for the light in darkness and to reach for the stars. 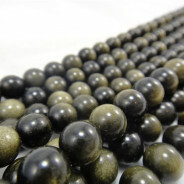 Goldstone is a type of glittering glass made in a low oxygen reducing atmosphere. 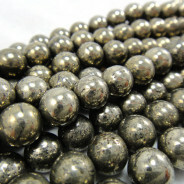 The original manufacturing process for goldstone was invented in Venice in the seventeenth-century by the Miotti family. Folklore describes goldstone as an acccidental discovery by an unnamed Italian monastic order or medieval alchemists, but there is no documentation to confirm this. 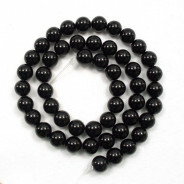 By substituting cobalt or manganese for the copper (used for red goldstone) the resulting crystals have a more silvery appearance and are suspended in a strongly-colored matrix of the corresponding ionic color, resulting in blue goldstone.